It was like that with him. He did the strangest things. Sometimes it was too much. It was like he was forcing you to choose. You could walk away, or you could take a deep breath, believe him, and go one more mile along the road. We often wondered who was taking the bigger risk, the ones who left, or the ones who stayed. Anyway, Jesus was waiting for an answer. So I shrugged. Made my choice. Again. Later, after everything was over, his mother reminded me that he had ridden once before, when he was a baby, the night the angel told Joseph to take Jesus to Egypt to protect him from Herod. 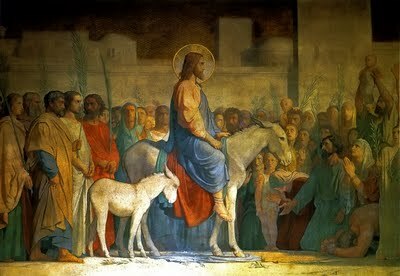 People say that Jesus rode a donkey into Jerusalem to signal peaceful intentions. It’s true—he wasn’t a conquering hero. He believed meekness was more powerful than violence. He was a servant, not a king. But after Mary told me about that time they fled into Egypt, I wondered if he chose the donkey as a kind of course correction. This time no angel-dream would save him in the nick of time. No mother keep him warm at her breast. No father protect him from the tyrants and the sword. This time he wouldn’t ride away from trouble. He would ride straight into it. On the donkey. On the carpet of coats and shawls. Through all the shouting and the palms. This entry was posted in Lent and Holy Week, Miscellaneous Commentary on March 24, 2013 by sicutlocutusest.